Once in the White House, Donald Trump may advance an immigration agenda with policies that do not necessarily reflect what he promised on the campaign trail. Comments made since the election by the President-elect on immigration have in some cases rolled back stances he took during the campaign. The “big, beautiful wall” that the Republican pledged to build along the entire U.S.-Mexico border, to the delight of audiences at countless campaign rallies, now may become a combination of walls and fencing, Trump acknowledged after the election. And the pledge to deport all 11 million unauthorized immigrants, marshaling a “deportation force” to do so, now appears limited to the small subset of those with criminal convictions, continuing a focus begun under the Obama administration. Campaign promises do not always translate into actual policies but immigration was seen as an exception this year, because it was a defining element of a highly polarized primary and general-election campaign and it touched on two of Trump’s most critical themes—jobs and security. Still, while his postelection comments have lent confusion about his intended goals, Trump’s choice of key advisors—including the selection of immigration hard-liner Jeff Sessions as his nominee for Attorney General—points to a reliably tough line ahead on immigration. 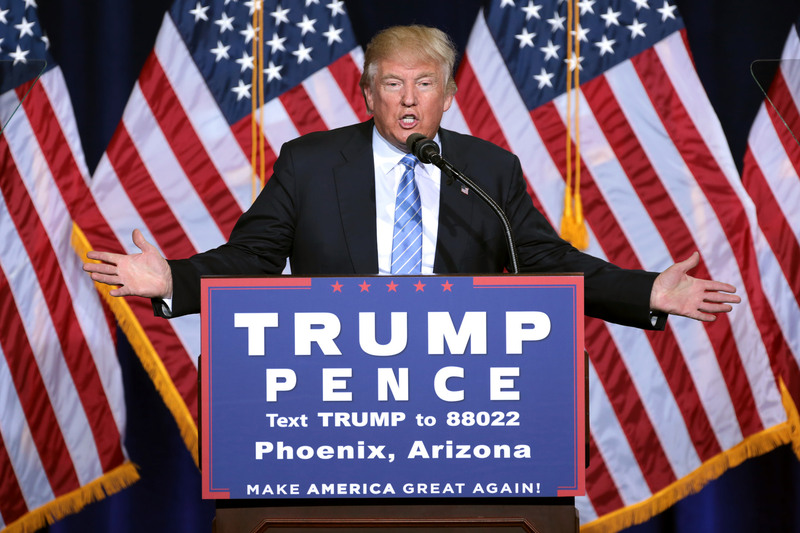 Based on Trump statements during and after the campaign, this article provides an analysis of what some of the better known elements of his immigration policy might look like. From the first days of his campaign, Trump has focused on the removal of unauthorized immigrants, initially all 11 million, and the threat posed by inflows of people he described as drug dealers, criminals, and rapists. During later comments, including a highly publicized speech on immigration in August, he narrowed somewhat to recent border crossers and unauthorized immigrants with criminal records or charged with crimes. During a post-election 60 Minutes interview, Trump stated that his priority would be the removal of unauthorized immigrants with criminal records, of which he said there are “probably two million, it could be even three million.” The basis for the number is unclear. The Department of Homeland Security (DHS) in 2012 estimated there were 1.9 million noncitizens who were removable on the basis of criminal convictions. However, this number includes both unauthorized immigrants and foreign nationals in the United States in permanent or temporary legal status who have become deportable as the result of a disqualifying crime. In 2015, the Migration Policy Institute (MPI) estimated there were 820,000 unauthorized immigrants with criminal convictions. While Trump’s statements appear to indicate a focus on criminal aliens, it is certainly within his authority to revise the Obama administration’s November 2014 DHS enforcement guidelines that place a low priority on unauthorized immigrants who have little or no criminal history. Changing the enforcement priorities could increase the number of noncitizens in removal proceedings, perhaps achieving deportations higher than the record seen in fiscal 2012, when nearly 410,000 noncitizens were removed. Regardless of deportation targets, the majority of those identified for removal will be entitled to due process, including court hearings. However, the immigration court system is already greatly overburdened, with a current backlog of more than 521,000 cases and an average wait time of 675 days for a hearing. Thus, without massive new appropriations, including a new infusion of immigration judges, any large-scale deportation ambitions would face significant delays. During the campaign, Trump strongly condemned so-called sanctuary cities. “Sanctuary cities” is a catchphrase for states and localities that limit the role their law enforcement agencies play in the enforcement of federal immigration law. Sanctuary policies have gradually grown as a backlash to the federal government’s dramatic increase of mechanisms for federal-state cooperation on immigration enforcement. For example, in 2008 the Bush administration introduced Secure Communities, a tool that automatically checked the immigration history of all individuals arrested and fingerprinted by state and local jurisdictions, allowing U.S. Immigration and Customs Enforcement (ICE) to place detainers on any noncitizen suspected of being removable. More than 360 jurisdictions adopted ordinances or policies limiting cooperation with ICE, citing concerns including the erosion of trust between law enforcement and the communities they police. In July 2015, the Obama administration replaced Secure Communities with the narrower Priority Enforcement Program, which is intended to be tailored to the priorities of local jurisdictions. Trump has stated his intent to revive Secure Communities and to sanction sanctuary jurisdictions by withholding federal funding—a move that has been proposed in a number of bills in Congress for more than a year. In recent weeks, several cities have reaffirmed their intent to keep their sanctuary policies intact. These include major jurisdictions such as New York, Los Angeles, Chicago, Philadelphia, San Francisco, Seattle, and Minneapolis. However, as the Obama administration learned, the cooperation of local jurisdictions is critical in placing a large flow of noncitizens with criminal records in removal proceedings, such as the ones the Trump administration will seek to penalize. Another Trump campaign promise was to rescind the Deferred Action for Childhood Arrivals (DACA) program, a 2012 Obama executive action that allows qualified unauthorized immigrants brought to the United States as children to apply for work authorization and protection against removal. So far, more than 740,000 unauthorized immigrants have received the two-year, renewable DACA benefit. Since the program was established by executive action, President Trump could rescind it with the stroke of a pen, as he has promised to do on Day 1. The question is whether he would immediately nullify the program and withdraw the protections and benefits from current beneficiaries, or would simply not allow individuals to renew their applications, letting DACA slowly die out. While immigrant-rights advocates speculate that Trump may decide not to rescind the program, he has not given any indication of a change of heart. The Trump proposal that garnered the most notoriety was the promise to build a wall along the entire nearly 2,000-mile U.S.-Mexico border and to make Mexico pay for it, with “Build the wall” a favored chant at Trump rallies. Still, Trump has recently suggested he would substitute fencing for a wall in certain locations, and a return to high-tech “virtual” fencing options could be back on the table as well. Trump is not the first to propose a wall along the border. The U.S. government first began building them in the 1990s, initially with a 66-mile fence in the San Diego area, later followed by fencing in El Paso and other highly trafficked areas. With passage of the Secure Fence Act in 2006, fencing was expanded to its current total of 652 miles in key areas. The efforts have not been without controversy, however, meeting with schedule delays, technological difficulties that ensnared the virtual fencing project, and large price tags. A huge new construction program, particularly in rugged and remote areas, could prove hugely costly and difficult to keep up with maintenance and the manpower essential to ensure effectiveness of the barriers. In the immigration area where he will have the most leeway, Trump can set the annual refugee admissions ceiling. Responding to the Syrian refugee crisis, President Obama set the overall refugee ceiling for fiscal year (FY) 2016 at 85,000, up from 70,000 in recent years. For FY 2017, he set the ceiling at 110,000. During the campaign, Trump repeatedly expressed concern over the speed of refugee resettlement and the ability of the U.S. government to properly vet refugees, especially from war-torn regions of the Middle East, including Syria. It thus seems likely that he will reduce the overall refugee ceiling once in office, or might limit or exclude refugee arrivals from specific countries. Whether his decision will affect refugees who have received permission to resettle in the United States but are awaiting travel, or those who are already undergoing screening remains to be seen. Thirty-one governors have protested the resettlement of Syrian refugees within their states. Legal actions taken by a number of these governors to block resettlement have failed in federal court and resettlement has continued. Recently, Trump promised that no refugee would be resettled without first consulting with the local community, suggesting his administration may forgo resettlement where there is local government resistance. Trump has also promised to suspend all immigration from terror-prone regions, until safe vetting can be “ensured,” and implement “extreme vetting,” including ideological tests, for all immigrants, no matter their country of origin. How both promises could be accomplished has yet to be fleshed out. In his August 2016 immigration speech—and reflected in the Republican convention platform— Trump called for a reduction in legal immigration, to “historical norms.” This proposal clearly has the stamp of Sessions, the Alabama senator who was one of Trump’s first campaign advisors. Trump has not, however, offered his definition of historical norms. If admissions of legal permanent residents are averaged out since recordkeeping began in 1820, there would be approximately 400,000 per year. Currently, the United States admits more than 1 million legal immigrants each year, meaning such an interpretation would result in major cuts in legal immigration flows. Congressional approval would be required, potentially setting up a clash with prominent GOP lawmakers who historically favor high levels of immigration, especially for business-related immigration. Trump has also endorsed the idea that annual levels of immigration be set on a periodic basis by a commission, based on U.S. economic performance and the needs of the U.S. job market. On different occasions Trump has also suggested that a greater share of immigrants be chosen based on merit and skill, which has been interpreted as meaning high-skilled individuals. What is unclear is whether he means permanent immigrants, temporary nonimmigrants, or both. The temporary H-1B program is an important component of the U.S. stream of high-skilled labor. However, Trump’s statements on the H-1B program have been remarkably contradictory, making it hard to discern what he believes. During the campaign, he advocated both for increasing and eliminating the H-1B visa program. His immigration speech and website both failed to directly address the issue, instead advocating for ensuring that U.S. jobs are offered to American workers first and that a higher portion of immigrants be high skilled. In a recent YouTube video, Trump listed actions he would be taking on his first day in office, including directing the Department of Labor to investigate abuses that “undercut the American worker.” This was likely a reference to H-1B program abuses, such as highly publicized instances at companies including the Walt Disney Co. and Southern California Edison, when U.S. workers were replaced by H-1B visa holders working for foreign outsourcing companies. Trump’s own contradictions on the H-1B program are reflective of similar struggles in Congress. The H-1B program has attracted critics across the political spectrum for abuse of U.S. workers. Advocates assert the program allows U.S. businesses to attract and hire the best talent in the global labor market. Since most legal immigration changes will require congressional approval, the executive and legislative branches will need to find common ground. Since his recent focus on removals of criminal aliens, Trump has not expressly stated a position on the remainder of the unauthorized population. However, in his 60 Minutes interview, Trump suggested once certain problems with the U.S. immigration system are tackled and the border is secure, he will work with Congress to address the fate of the unauthorized population, who he pointedly referred to as “terrific people”—his warmest comments to date. While it is unknown whether he intends to push for legalization and on what timeline, for a campaign framed on a promise to deport all 11 million unauthorized beginning Day 1 of his presidency, the comments may suggest an unanticipated opening. Housing a Record Number of People in Detention, ICE Turns to More Private Prisons. U.S. Immigration and Customs Enforcement (ICE) is housing a record number of immigrants in detention, with the population reaching 41,000 as of November 2016 and projected to rise to 47,000 by mid-2017. The detained population typically fluctuates between 31,000 and 34,000, according to Homeland Security Secretary Jeh Johnson. This major increase will require additional beds and detention facilities, pushing the agency to increase its use of private prisons even as the Department of Justice announced plans to end its own partnerships with private prison contractors and the Department of Homeland Security begins its own review of privatized immigrant detention. Several private prisons that lost Justice Department contracts are now looking to ICE. Among them is Cibola County Correctional Center in New Mexico, run by CoreCivic, which was rated one of the worst federal private prisons and often operated without a doctor on site. The increase in the detained population has been attributed to increased unauthorized arrivals of Central American and Haitian nationals. United States and Australia Announce Deal on Refugee Resettlement. The United States has agreed to resettle an as-yet undetermined number of refugees detained by Australia on the island nation of Nauru and on Manus Island in Papua New Guinea. Australia has refused to resettle this population per a 2013 Australian policy that bans resettlement of any refugee who arrives by boat. There are about 1,300 detained asylum seekers on Nauru and Manus islands who would be eligible for U.S. resettlement, in addition to 370 who were provided medical treatment in Australia and refused to return to the islands. This deal comes after Australia agreed in September to take part in a U.S. program to resettle Central American refugees from camps in Costa Rica. Because the United States has only just begun vetting the detainees on Nauru and Manus islands, approved refugees will not be resettled before Donald Trump assumes the presidency on January 20, subjecting the deal to a fresh review. Trump has vowed to temporarily suspend immigration from countries “compromised by terrorism” and previously suggested banning the entry of all Muslims. Many of the detained asylum seekers are Muslims from countries such as Pakistan, Afghanistan, Iraq, and Syria. Thousands of DACA Recipients Lose Work Authorization Due to Renewal Backlog. U.S. Citizenship and Immigration Services (USCIS) is experiencing extensive delays in approving renewal applications for the Deferred Action for Childhood Arrivals (DACA) program and extending the work authorization that comes with DACA. The delays have forced some DACA recipients to take weeks of unpaid leave or to resign from their jobs. A USCIS spokeswoman blamed “technical problems” for the delay of several thousand applications, most of which were submitted between February and June. DACA provides beneficiaries with a reprieve from deportation and work authorization. Recipients must renew their benefit every two years. Mexican Foreign Minister Announces New Services for Mexican Nationals in the United States. In the aftermath of the U.S. election, the Mexican Foreign Ministry will expand the consular services it offers to Mexicans living in the United States, seeking to protect against possible immigration fraud and abuse. New and updated services will include a 24-hour immigration hotline, increased appointments for Mexican nationals to request identity documents, and increased availability of mobile consulate services. The announcement came as officials from El Salvador, Guatemala, and Honduras began working together to shape a joint strategy addressing policy on jobs, migration, and investment under the incoming Trump administration. The three Northern Triangle countries are also asking Mexico to work with them to protect migrants from their countries, and to serve as a liaison to the United States. Northern Triangle Countries Launch Plan to Fight Gangs and Slow Migration. The governments of El Salvador, Guatemala, and Honduras launched the Tri-national Task Force Against Gangs on November 15 as part of the U.S.-funded Alliance for Prosperity, which is a jointly developed plan by the governments of the United States, Honduras, Guatemala, and El Salvador to address the root causes of migration, such as poverty and gang violence. The task force will function mainly at the countries’ shared borders, allowing police officers and soldiers to undertake joint operations targeting gangs and those involved in human smuggling and drug trafficking, with the objective of lowering murders and decreasing migration. The joint operation will be comprised of personnel from the security, justice, intelligence, and defense sectors in the three countries. Guatemalan Foreign Minister Carlos Raul Morales said the $750 million pledged by the United States under the Alliance for Prosperity has yet to materialize. Controversial Arizona Sheriff Loses Bid for Seventh Term. Joe Arpaio, who gained a national following with his staunchly hard line on immigration enforcement as Sheriff of Maricopa County, Arizona, lost his reelection race in November to Democrat Paul Penzone. Widely known for enforcement efforts including using local deputies to conduct immigration sweeps and housing suspected immigration violators in "tent city" jails, Arpaio has been under investigation by the Justice Department. A young, mobilized Latino population was credited for his defeat. The local race drew national attention, as Arpaio and President-elect Donald Trump supported each other, and liberal donor George Soros spent more than $2 million to defeat the sheriff. Separately, Justice Department attorneys issued criminal contempt of court charges against Arpaio in October 2016 for defying a 2011 court order directing his office to stop detaining people on suspicion of being unauthorized immigrants. That 2011 order was issued as part of a 2007 racial profiling case against Arpaio. His trial on the contempt charges is set for December 6. Maine Governor Withdraws State from Refugee Resettlement Program. Citing security concerns, Maine Governor Paul LePage withdrew his state’s participation from the federal refugee resettlement program. Maine becomes the fourth state to withdraw from the federal program this year, joining Kansas, New Jersey, and Texas. While the order bars Maine government officials from participating in resettlement efforts, it does not prohibit private organizations from resettling refugees in the state. When states withdraw participation, resettlement is managed exclusively by nonprofit organizations through a federal Office of Refugee Resettlement (ORR) program called Wilson-Fish. ORR funds Wilson-Fish programs in 12 states: Alabama, Alaska, Colorado, Idaho, Kentucky, Louisiana, Massachusetts, Nevada, North Dakota, South Dakota, Tennessee, and Vermont. Jessica Bolter is a Research Intern with MPI's U.S. Immigration Policy Prorgam. With discussion of a possible proposal to register and track immigrants from Muslim countries once again in the news, it is a timely moment to review the history of such programs in the United States. This article from MPI's online journal, the Migration Information Source, examines the controversial post-9/11 program known as the National Security Entry-Exit Registration System (NSEERS), which required certain noncitizens from a number of Muslim-majority countries to register and report for questioning before authorities. The program was terminated in 2011 following widespread criticism.